One thing you need to know is that pressure tanks are not made the same. You will find them in different designs, materials, capacities, and finishes. Some come as fully integrated systems for great convenience during installation. Below, we look at the best water pressure tanks that will help you solve pressure woes in an instant. This 44-gallon water tank holds enough water for institutional and large residential use. It handles larger demands yet stays compact enough to save space. The shell is made of mill steel to keep weight to a minimum and provide extra strength. Inside is a polypropylene liner that adds strength and protects the steel against corrosion. A welded stainless steel valve gives great convenience by locking in pressure. This tank comes pre-charged at 38psi and is fully integrated for better performance. This vertical pressure tank is designed to meet the required and sanitation standards. The dome shell of this tank is made of deep drawn steel, which gives double the strength of standard rolled steel. A seamless construction allows the tank to flex, a feature that prevents deformation. There is a polypropylene liner on the inside to protect against corrosion and preserve water taste and color. The exterior of the shell has a high gloss enamel finish that comes in handy to protect the tank from the elements. This 20-gallon tank comes pre-charged at 25psi. 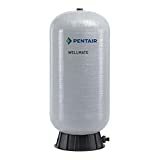 This medium-sized pressure tank is ideal for residential use. The tank has a compact footprint to save installation space. High-strength steel is used to make the shell, a construction that stands up well to high pressure and daily abuse. A corrosion-resistant polypropylene liner is used on the inside. This pressure tank has a fully integrated system to give better performance compared to other water chamber designs. Rather than a threaded valve, this tank uses a welded valve to prevent loss of air pressure. The tank is pre-charged at 38psi. This rugged tank gives years of trouble-free use. The tank is made of cold-rolled steel for higher strength while keeping weight to a minimum. A sturdy base adds stability and has a plastic strip to protect from scratches. Polyolefin liner is used in this tank to keep the steel from being corroded. 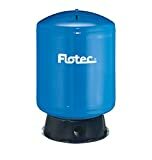 WaterWorker HT-32B pressure tank has a glossy blue finish, which resists sunlight and other harsh elements. Flotec FP7120 is a good space saver. In fact, it requires 50% less space compared to standard conventional tanks. The body of the tank is constructed of heavy-gauge steel to give years of trouble-free service. The liner is made of one-piece seamless PVC that keeps the water from metal components. The air valve is located at a convenient point for quick hook up. This pressure tank comes with a stable stand for easy installation. It is pre-charged at 40psi to give a performance that equals that of 82-gallon standard water tank. This tank offers great convenience during service and installation, thanks to the tee kit, union, and valves included in the package. Deep drawn steel is used to construct the shell for improved material strength. The inner shell of the tank has a unique design that keeps the tank from over-expanding. Fusion bonded polymeric liner is used to prevent corrosion. This tank sits on a heavy-duty polypropylene base that gives extra protection from rust and corrosion. A glossy finish used on the tank reduces damage resulting from sunlight and other harsh elements. 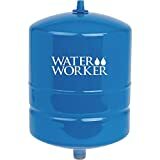 WaterWorker HT-2B is a small pressure tank for domestic use. The tank has a heavy-duty shell made of steel to give years of trouble-free service. A seamless rubber diaphragm offers uniform strength and resists bacterial growth to preserve the natural taste and color of water. The tank comes with copper fitting resistant to rust and corrosion. A reflective gloss enamel finish protects the tank from sunlight and harsh weather elements. The deep drawn steel used on this water pressure tank gives double the strength of standard cold-rolled steel. The tank is pre-charged at 25psi. This in-line pressure tank gives a performance equal to a standard tank with a 42-gallon capacity. A heavy-gauge steel construction gives strength and durability for years of service. 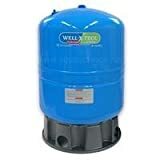 This tank delivers a maximum water pressure of 50psi enough to cater for most domestic applications. An appliance-like finish protects the tank from harsh weather elements for worry-free use. This tank sits on a tough plastic base. The plastic base keeps the tank off the ground to reduce the effects of rust and corrosion. Wellmate WM-9 is a fiberglass pressure tank that offers many extra benefits compared to steel tanks. The fiberglass construction keeps weight to a minimum without sacrificing strength. The outer shell is made of fiberglass sealed with epoxy resin. This composite shell means little or no maintenance is required. The interior air cell is made of heavy-gauge polymer and can be replaced for great convenience. This pressure tank rests on a sturdy base fitted with inlet/outlet made of molded PVC for improved resistance to impact.